Hello readers. It’s been awhile since I have posted due to the busy holiday season. But I am back with a special review. From the moment I heard reviews of the first issue of Manhattan Projects I swore I would never read it. I couldn’t tell you why. But it rubbed me wrong how everybody raved about how amazingly genius it was. I admit that my logic seems flawed and that I come across very hipster in this decision. But in my defense I am also not a huge fan of most of Hickman’s books. They are all a little too high concept for me. Manhattan Projects is a lot more interesting than I ever expected. Taking the basics of the true story of it’s namesake and rewriting it with a much more fantasy twist. In the version the book shows the atomic bomb was just a cover project for bigger things. Such as alternate realities, alien empires, Artificial Intelligences and Stargate-esque teleportation. The players in the grand game of the series are a superteam of scientific genius’ from all over the world. You have Oppenheimer, who is actually the evil twin of the Oppenheimer that history remembers. And he eats the brains of other beings to gain their knowledge. Albert Einstein, who is revealed to be an alternate reality version. Von Braun the Nazi scientist, but with a robotic arm. Who defects to America to save himself and with the hope of getting to move his science forward under the Manhattan Projects. Among others. The story is only getting started in this first volume, much like most of Hickmans books, so I really don’t know where the series is headed in the big picture. But what little bit is revealed in this volume has some real potential. Hickman puts together a deep world of some pretty dark science, and it’s effects on life and war. I get the feeling that he is setting up a deeper message of whether we should do something just because we can. But that could be me projecting my feelings on how science moves forward sometimes with little thought of the repercussions. The art of Nick Pitarra is a real treat. It is rough around the edges in a beautiful way. Pitarra makes it really easy to follow even when the craziest of situations is being portrayed. And with the help of Jordie Bellaire’s color work, the multiple pathways and personalities of characters are brought out perfectly into a clear story. 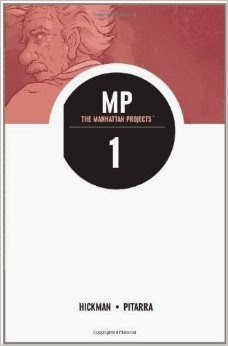 I was pleasantly surprised by Manhattan Projects. It took concepts that I have very little prior knowledge or interest in and made me interested for the time I was reading it. That said though I probably won’t be rushing out to read the next volume. Maybe next time my local comic shop has a sale I will pick up more, but it’s just not a huge priority. This year I want to really devote more time to making Once Upon A Longbox a bigger outlet. So I am really welcoming on recommendations for me to read and review. If anyone has anything that they think I might enjoy, or even if it is just a book you are really enjoying but it doesn’t get the credit you feel it deserves send it my way. As always thanks for reading my review. And keep reading fellow comic fans.